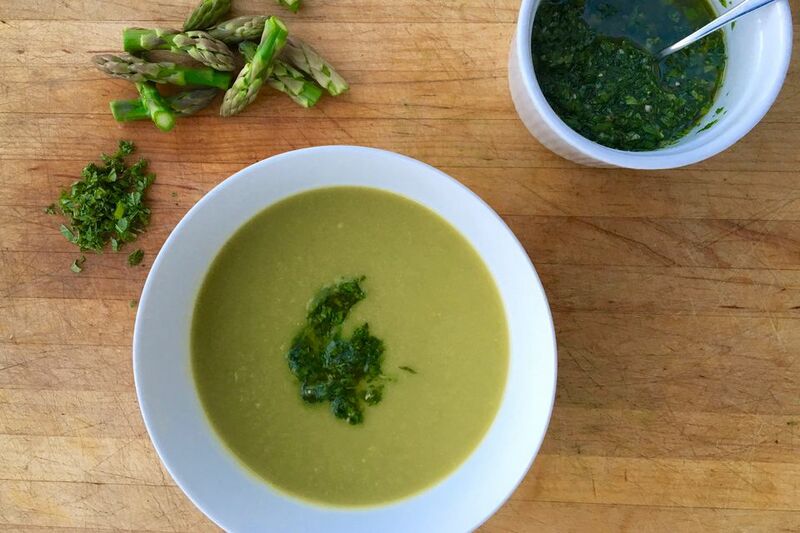 This fresh spring asparagus soup is thickened with chickpeas and flavored with gremolata, a mixture of parsley, garlic, and lemon. Serve it as a first course at a spring dinner party or as a light main course with a side salad, a bit of cheese, and some crusty bread. Trim the asparagus stalks by cutting off and discarding the bottom inch or so of the stalks (if the ends are dried out or browning, cut off and discard enough of the ends to get rid of that!). Cut off the asparagus tips (just the top 1-inch or so) and set them aside. Roughly chop the remaining bulk of the asparagus stalks and set them aside separate from the tips. Put the chickpeas and broth in a medium saucepan. Bring to a boil over high heat. Add the asparagus stalks and salt, if using. Adjust the heat to maintain a steady simmer and cook until the asparagus is very tender, 5 to 10 minutes depending on how thick the asparagus stalks are. While the soup simmers, mince the parsley. Put it in a small bowl. If using the mint, mince that as well and add it to the parsley. Peel and mince the garlic and add it to the parsley. Zest the lemon into the parsley-garlic mixture. Cut the lemon in half and juice it into the mixture. Add the olive oil and the pepper. Stir to combine. Add salt to taste and set aside. If you have a hand-held blender, now is a great time to use it—whirl the soup in the pot until smooth. Whirl until utterly, completely smooth. Return the soup to pot and bring it to a simmer. Add the reserved asparagus tips, reduce heat to maintain a simmer, and cook until the tips are tender, about 3 minutes. Add salt to taste. Serve the soup hot, with a drizzle of the garlic-parsley mixture swirled on top. Omit most of the salt if using store-bought broth. No hand-held blender? Whirl the soup in a food processor or blender. Be sure to cover the top with a kitchen towel to catch any spurts and avoid any burns.